Endgames are about showdowns, whether epic or not, and they are found everywhere–in games like chess, in business, in politics, in religion, in the military, in all types of relationships, and, in fact, life in general. It’s about strategies and the age old conflict between good and evil (the lines, of which, have significantly blurred of late). This type of warfare is not fought with traditional weapons or even out in the open as on a battlefield (as in typical war scenarios). It is about using strategy and deception to conquer an enemy, and it’s base is psychological. Although Sun Tzu’s “Art of War” was written more than 2,600 years ago and it’s not a chess book, this is one of the books that I would recommend to chess players. This work stands today as a prominent work on military strategy! This manual is not only about war strategy, but, also about the lessons and knowledge that can be learned within a strategic framework, as is required in many aspects of life, including but not limited to war. I recommend this book to chess players, as it is a masterpiece in strategy, which can be especially useful in preparation for a chess tournament. This book is an easy read – light and deep at the same time. Even in this century, many high school and college faculty members use quotes from this book in their lectures. A paradox , given our dreadful advances in the technology of warfare. Thus we may know that there are five essentials for victory: (1) he will win who knows when to fight and when not to fight; (2) he will win who knows how to handle both superior and inferior forces; (3) he will win whose army is animated by the same spirit throughout all its ranks; (4) he will win who, prepared himself, waits to take the enemy unprepared; (5) he will win who has military capacity and is not interfered with by the sovereign. There are not more than five musical notes, yet the combinations of these five give rise to more melodies than can ever be heard. There are not more than five primary colors, yet in combination they produce more hues than can ever been seen.There are not more than five cardinal tastes, yet combinations of them yield more flavors than can ever be tasted. If you happen to be Christian, as you should know, deceit and deception are not a part of the Christian’s “modus operandi,” although we run into it often even in Christian circles, and we are tempted to do it ourselves at times, too. Other bits of advice in “The Art of War” are just some good common sense in dealing with others; but the main premise behind “The Art of War” is how to subdue your enemy using deception and psychological warfare. As Christians, it never hurts to understand and be aware of what others might be doing to us that is not on the “up and up” whether at work, in social circles, in relationships, and everywhere else. Reading even some of “The Art of War” (as in the 31 points listed above) will at least clue us in on how others might be operating in our lives. We (e.g., Christians) are taught to be “shrewd as snakes and innocent as doves” (those are Jesus’ own words in Matthew 10:16). However, too often, we massively fail at the “shrewd” part in that verse. Why do we so often “miss the mark” on being shrewd? It is probably, in no small part, in an effort to keep harmony with others; to think good about others and not evil. But there is a significant difference between being naively trusting of others and being shrewd. The world, then as now, was hostile to believers—not incidentally hostile, but purposefully hostile. Wolves are intentional about the harm they inflict upon sheep. In such an environment, the question becomes “how can we advance the kingdom of God effectively without becoming predatory ourselves?” Jesus taught His followers that, to be Christlike in a godless world, they must combine the wisdom of the serpent with the harmlessness of the dove. Nineteenth-century pastor Charles Simeon provides a wonderful comment on the serpent and dove imagery: “Now the wisdom of the one and the harmlessness of the other are very desirable to be combined in the Christian character; because it is by such an union only that the Christian will be enabled to cope successfully with his more powerful enemies” (Horae Homileticae: Matthew, Vol. 11, London: Holdsworth and Ball, p. 318). Most people don’t mind having their character compared to a dove’s purity and innocence. But some people recoil at the image of a serpent, no matter what the context. They can never see a snake in a good light, even when used by Jesus as a teaching tool. But we should not make too much of the simile. We cannot attach the evil actions of Satan (as the serpent) with the serpent itself. Animals are not moral entities. The creature itself cannot perform sin, and shrewdness is an asset, not a defect. This is the quality that Jesus told His disciples to model. The serpent simile stands in Jesus’ dialogue without bringing forward any of the serpent’s pejoratives. It is a basic understanding in language that, when a speaker creates a simile, he is not necessarily invoking the entire potential of the words he has chosen—nor is he invoking the entire history and tenor of the linguistic vehicle. Rather, the speaker is defining a fresh relationship between the two things. A quick look at Matthew 10:16 shows that Jesus was invoking only the positive aspects of the serpent. There is no hint of His unloading Edenic baggage upon His disciples. He simply tells them to be wise (and innocent) as they represented Him. When Jesus told the Twelve to be as wise as serpents and harmless as doves, He laid down a general principle about the technique of kingdom work. As we take the gospel to a hostile world, we must be wise (avoiding the snares set for us), and we must be innocent (serving the Lord blamelessly). Jesus was not suggesting that we stoop to deception but that we should model some of the serpent’s famous shrewdness in a positive way. Wisdom does not equal dishonesty, and innocence does not equal gullibility. Let us consider Jesus as exemplar: the Lord was known as a gentle person. Indeed, Scripture testifies that He would not even quench a smoking flax (Matthew 12:20). But was He always (and only) gentle? No. When the occasion demanded it, He took whip in hand and chased the money changers out of the temple (John 2:15). Jesus’ extraordinarily rare action, seen in light of His usual mien, demonstrates the power of using a combination of tools. This “dove-like” Man of Innocence spoke loudly and clearly with His assertiveness in the temple. In His more typical moments, Jesus showed that He was as wise as a serpent in the way He taught. He knew enough to discern the differences in His audiences (a critical skill), He used the story-telling technique to both feed and weed (Matthew 13:10–13), and He refused to be caught in the many traps that His enemies laid for Him (Mark 8:11; 10:2; 12:13). Jesus showed that He was as harmless as a dove in every circumstance. He lived a pure and holy life (Hebrews 4:15), He acted in compassion (Matthew 9:36), and He challenged anyone to find fault in Him (John 8:46; 18:23). Three times, Pilate judged Jesus to be an innocent man (John 18:38; 19:4, 6). The apostle Paul also modeled the “wise as serpents, harmless as doves” technique. Paul lived in dove-like innocence in good conscience before God (Acts 23:1) and learned to deny his carnal desires so as not to jeopardize his ministry (1 Corinthians 9:27). But Paul also displayed serpent-like shrewdness when he needed it. He knew his legal rights and used the legal system to his advantage (Acts 16:37; 22:25; 25:11). He also carefully crafted his speeches to maximize the impact on his audience (Acts 17:22–23; 23:6–8). In Titus 3:2 we are reminded “to slander no one, to be peaceable and considerate, and always to be gentle toward everyone,” and that includes those who accuse us of doing wrong or who are acting deceptively behind our backs. Such is the world in which we live, but we are not to act or react as they do. I’ll end this post with Jesus’ words in John 13:34: “A new command I give you: Love one another. As I have loved you . . . So you must . . .
One another . . . . This is a follow up blog post to my last post on this blog titled, “Between Palm Sunday and Good Friday.” This post will take us from Good Friday through Easter Sunday. For Christians, Good Friday is a crucial day of the year because it celebrates what we believe to be the most momentous weekend in the history of the world. Ever since Jesus died and was raised, Christians have proclaimed the cross and resurrection of Jesus to be the decisive turning point for all creation. Paul considered it to be “of first importance” that Jesus died for our sins, was buried, and was raised to life on the third day, all in accordance with what God had promised all along in the Scriptures (1 Corinthians 15:3). The “where was Jesus?” question understandably becomes very common around Easter. The death and resurrection of Christ being celebrated on Good Friday and Easter Sunday raise the questions: What happened in between? Where was Jesus and what was He doing for those three days? Why three days? Did Jesus go to hell in between His death and resurrection? etc., etc. Answering the questions is difficult because the Bible does not say much about where Jesus was and what He was doing between His death and resurrection. The Bible gives a few details, but even the interpretation of those details is difficult. There are three primary Bible passages that give us hints to the “Where was Jesus?” question. First, Acts 2:31(see also Psalm 16:10-11), says that Jesus was not abandoned to Hades. Hades is the realm of the dead. Jesus was in the realm of the dead, but He did not remain there. Why was Jesus sent to the realm of the dead? The second passage, 1 Peter 3:18-19, likely answers the question. Jesus went to Hades in order to preach to the spirits in prison. Who were the spirits in prison? According to 1 Peter 3:20, they were those “who disobeyed long ago when God waited patiently in the days of Noah while the ark was being built.” This is referring back to the Genesis 6 account. But, that does not answer the question either, as there is disagreement over that passage as well. Were the sons of God who married the daughters of men fallen angels or human beings? If the answer is fallen angels, were the spirits in prison those fallen angels that God judged for their sin in Genesis 6, or were they the spirits of the people who had been destroyed by the flood? The most interesting and frustrating part of the “where was Jesus?” discussion is that every disagreement leads to other disagreements. The third passage is Ephesians 4:8-10, which refers to Jesus leading “captivity captive” (KJV) or leading “a host of captives.” What in the world does this refer to? Most Bible scholars believe it refers to Jesus taking all of the righteous dead, who were held “captive” in the paradise compartment of Sheol/Hades, and taking them to heaven. Prior to the death of Christ, the righteous dead were saved, but since their sins had not been atoned for, they were not allowed in heaven. Once Jesus’ sacrifice had been applied to them, they were allowed entrance into heaven, and Jesus took them there. That is sure a lot to read into “taking captivity captive,” but that is how most Bible scholars interpret the text. So, where was Jesus for the three days in between His death and resurrection? For a time, He was in Hades, preaching to the spirits in prison (whoever they were). Then, He released all of the righteous dead of Sheol/Hades and took them with Him to heaven. But, again, there is controversy on virtually every point. There is a lot of confusion regarding what Easter Sunday is all about. For some, Easter Sunday is about the Easter Bunny, colorfully decorated Easter eggs, and Easter egg hunts. Most people understand that Easter Sunday has something to do with the resurrection of Jesus, but are confused as to how the resurrection is related to the Easter eggs and the Easter bunny. Biblically speaking, there is absolutely no connection between the resurrection of Jesus Christ and the common modern traditions related to Easter Sunday. As a background, please read our article on the origins of Easter. Essentially, what occurred is that in order to make Christianity more attractive to non-Christians, the ancient Roman Catholic Church mixed the celebration of Jesus’ resurrection with celebrations that involved spring fertility rituals. These spring fertility rituals are the source of the egg and bunny traditions. The Bible makes it clear that Jesus was resurrected on the first day of the week, Sunday (Matthew 28:1; Mark 16:2,9; Luke 24:1; John 20:1,19). Jesus’ resurrection is most worthy of being celebrated (see 1 Corinthians 15). While it is appropriate for Jesus’ resurrection to be celebrated on a Sunday, the day on which Jesus’ resurrection is celebrated should not be referred to as Easter. Easter has nothing to do with Jesus’ resurrection on a Sunday. As a result, many Christians feel strongly that the day on which we celebrate Jesus’ resurrection should not be referred to as “Easter Sunday.” Rather, something like “Resurrection Sunday” would be far more appropriate and biblical. For the Christian, it is unthinkable that we would allow the silliness of Easter eggs and the Easter bunny to be the focus of the day instead of Jesus’ resurrection. By all means, celebrate Christ’s resurrection on Easter Sunday. Christ’s resurrection is something that should be celebrated every day, not just once a year. At the same time, if we choose to celebrate Easter Sunday, we should not allow the fun and games to distract our attention from what the day should truly be all about—the fact that Jesus was resurrected from the dead, and that His resurrection demonstrates that we can indeed be promised an eternal home in Heaven by receiving Jesus as our Savior. Jesus didn’t stay in the grave. He has risen just like he said he would (see Luke 24). So I’ll end this post as I did on my previous post with these three words . . . Passion Week (also known as Holy Week) is the time from Palm Sunday through Easter Sunday (Resurrection Sunday). Also included within Passion Week are Holy Monday, Holy Tuesday, Spy Wednesday, Maundy Thursday, Good Friday, and Holy Saturday. Passion Week is so named because of the passion with which Jesus willingly went to the cross in order to pay for the sins of His people. Passion Week is described in Matthew chapters 21-27; Mark chapters 11-15; Luke chapters 19-23; and John chapters 12-19. Passion Week begins with the triumphal entry on Palm Sunday on the back of a colt as prophesied in Zechariah 9:9. Following the trials, Jesus was scourged at the hands of the Roman soldiers, then was forced to carry His own instrument of execution (the Cross) through the streets of Jerusalem along what is known as the Via Dolorosa (way of sorrows). Jesus was then crucified at Golgotha on the day before the Sabbath, was buried and remained in the tomb until Sunday, the day after the Sabbath, and then gloriously resurrected. One of the things anyone notices about the Gospels is that they each tell the story of Jesus’ Passion in their own way, and that it’s very difficult to square the chronologies (Ian Paul on his blog has a good discussion of this). There are various things that do appear to have happened, though, in whatever order they might have been. The Sanhedrin (the Jewish Council) met and agreed to betray Jesus (Matthew 27:3-5). Jesus was anointed at Bethany (Matthew 26:6-13, Mark 14:3-9). What seems to be a version of this story appears in Luke’s Gospel in chapter 7, 36-50; in John, it happens before the Triumphal Entry (12:1-11) and Mary is named as the woman. Jesus curses the fig tree, which withers and dies. It’s a symbolic parable of judgment (Matthew 21:18-22, Mark 11:12-14, 21). Jesus cleanses the Temple (Matthew 21:12-16, Mark 11:15-19, Luke 19:45-47). In John 2:13-16 this happens at the beginning of Jesus’ ministry; some commentators think it may have happened twice, others that it’s the same story put in a different context. Jesus debates with the Pharisees and Sadducees and teaches the crowds. Matthew has the parable of the wedding banquet and the parable of the tenants, for instance, the teaching about paying taxes to Caesar (22-23) and a section on the ‘signs of the end of the age’. Mark and Luke have the story of the widow’s mite (Luke 21:1-4). John has a long section of teaching directed at the disciples (14-17). Judas agrees to betray Jesus (Matthew 26:14-16, Luke 22:1-6); the Wednesday of Holy Week is sometimes called Spy Wednesday for this reason. Jesus predicts his death (John 12: 20-36). He shares a Last Supper with his disciples (Matthew 26:17-30, Mark 14:12-26, Luke 22, John 13). He and his disciples go to the Garden of Gethsemane (Matthew 26:36-46, Mark 14:32-52, Luke 22:39-46, John 18:1-11). In Luke’s and John’s Gospels the garden is not named. It’s there that Jesus is arrested. All of these things appear in the different Gospels between Palm Sunday and Good Friday. We should be aware, though, that they didn’t have the same ideas about chronology as us: they were writing history, but of a particular type. So they would have thought it perfectly reasonable to shift things around a bit to make it fit the meaning of the story. What seems likely, though, is that Jesus was in the public eye and that there were confrontations with authority. On a purely human level, he must have known that the end was coming. For anyone else, that would paralyze them with fear. But Jesus continued his ministry, preaching, teaching and challenging, when he could have left the city and been safe at any time. “Sermon on the Mount” (Matthew 5-7) is one of the best known and most quoted parts of the New Testament. It includes the Beatitudes and the Lord’s Prayer. To most believers in Jesus, the Sermon on the Mount contains the central tenets of Christian discipleship, The Beatitudes are a key element of this sermon, and are expressed as a set of “blessings.” The Beatitudes present a new set of Christian ideals that focus on love and humility rather than force and exaction; they echo the highest ideals of the teachings of Jesus on mercy, spirituality and compassion. They also teach on issues such as divorce, lust, and worldliness; issues pertaining to persecution; further instruction on how to pray; and words on false prophets. The second discourse in Matthew 10 provides instructions to the Twelve Apostles and is sometimes called the “Mission Discourse” or the “Missionary Discourse” or the “Little Commission” in contrast to the Great Commission. This discourse is directed to the twelve apostles who are named in Matthew 10:2-3. The third discourse in Matthew 13 :1-53 provides several parables for the Kingdom of Heaven and is often called the “Parabolic Discourse.” The first part of this discourse in Matthew 13:1-35 takes place outside when Jesus leaves a house and sits near the Lake to address the disciples as well as the multitudes of people who have gathered to hear him. This part includes the parables of the Sower, the Tares, the Mustard Seed and the Leaven. In the second part Jesus goes back inside the house and addresses the disciples. This part includes the parables of the Hidden Treasure, the Pearl and Drawing in the Net. The fourth discourse in Matthew 18 is often called the “Discourse on the Church.” It includes the parables of The Lost Sheep and The Unforgiving Servant which also refer to the Kingdom of Heaven. The general theme of the discourse is the anticipation of a future community of followers, and the role of his apostles in leading it. Addressing his apostles in Matthew 18:18, Jesus states: “what things soever ye shall bind on earth shall be bound in heaven; and what things soever ye shall loose on earth shall be loosed in heaven”, see also Binding and loosing…. The discourse emphasizes the importance of humility and self-sacrifice as the high virtues within the anticipated community. It teaches that in the Kingdom of God, it is childlike humility that matters, not social prominence and clout. There are clearly two parts to that question. Jesus had just prophesied the destruction of the temple, and the disciples asked when that would happen AND what will be the sign of your coming and the end of the age. The trick is that Jesus understood those two events were not concurrent. The temple was destroyed in AD 70, yet Jesus still hasn’t returned as of today—but the disciples didn’t and couldn’t have known that. They assumed that the destruction of the temple would be the climactic event of the end times. They didn’t realize that it would only be the beginning. Therefore, as we listen to what Jesus said by way of response, we have to remember that he is talking about a near future and a far future and we have to understand which is which. There are a couple of key indicators in the text. Look for examples at verse 6 and verse 8. After talking about some things that would happen he says: “but the end is not yet” (v. 6) and “All these are but the beginning of the birth pains” (v. 8). The end is not yet. This is just the beginning. Jesus seems to be saying that a bunch of things are going to happen that are NOT the end times events the disciples were thinking they were. Things like wars, things like the rise and fall of empires, things like massive natural disasters. Those things are not signals of the end–rather they are more like table setters. They are like birth pangs. They open the door, but they are not the baby. After these things, you want to watch for a couple of indicators. Watch for the Great Commission to be completed in an environment of increasing persecution, tribulation, false religion and apostasy; then the end will come. Look at verse 14: “And this gospel of the kingdom will be proclaimed throughout the whole world as a testimony to all nations, and then the end will come” (Matthew 24:14 ESV). The Bible records Jesus’ visiting the Mount of Olives three times in the last week of His earthly life, and each time something of significance happened. The first visit is what we call the triumphal entry. The donkey Jesus rode that day was found in the area of Bethany and Bethphage, on the east side of the Mount of Olives (Luke 19:29–30). Then, “when he came near the place where the road goes down the Mount of Olives, the whole crowd of disciples began joyfully to praise God in loud voices for all the miracles they had seen” (verse 37). While still on the Mount of Olives, Jesus looked at the vista in front of Him, wept over the city, and pronounced a judgment against it (verses 41–44). Jesus’ second visit was to deliver what has come to be known as the Olivet Discourse, recorded in Matthew 24:1 —25:46. Parallel passages are found in Mark 13:1–37 and Luke 21:5–36. The content of the Olivet Discourse is Jesus’ response to His disciples’ question “When will these things be, and what will be the sign of your coming and of the close of the age?” (Matthew 24:3). Jesus’ teaching in Matthew 24—25 primarily concerns the coming destruction of Jerusalem, the future tribulation period, and the second coming of Christ at the end of the tribulation. The Discourse includes parables about those who wait for the Master’s coming—the wise and faithful servant (Matthew 24:45–51), the five wise virgins (Matthew 25:1–13), and the good servant who uses his resources wisely (Matthew 25:14–30). Jesus’ third visit during the week of His passion was on the night He was betrayed. That evening began with the Last Supper in Jerusalem and ended in the Garden of Gethsemane on the Mount of Olives. During that last Passover meal, Jesus washed His disciples’ feet and then revealed Judas as the betrayer (John 13:1–30). At the conclusion of the meal, Jesus established the New Covenant and instituted the Lord’s Supper (Matthew 26:26–29; 1 Corinthians 11:23–26). Then He took His disciples to the Garden of Gethsemane (literally, “Garden of the Oil-press”) located on the western slope of the Mount of Olives. There Jesus prayed in agony as He contemplated the day to come. So overcome by the horror of what He was to experience in the crucifixion the following day that His sweat was “like drops of blood” (Luke 22:44) and God sent an angel from heaven to strengthen Him (Luke 22:43). After Jesus prayed, Judas Iscariot arrived with a multitude of soldiers, high priests, Pharisees, and servants to arrest Jesus. Judas identified Jesus by the prearranged signal of a kiss, which he gave to Jesus. Trying to protect Jesus, Peter drew a sword and attacked a man named Malchus, the servant of the high priest, cutting off his ear. Jesus rebuked Peter and healed the man’s ear, displaying the miraculous power of God (Luke 22:51). Nevertheless, the mob arrested Jesus and took Him to face trial, while the disciples scattered in fear for their lives. After the trials, crucifixion, and resurrection, Jesus once again stood on the Mount of Olives. During His final post-resurrection appearance, Jesus led His disciples “out to the vicinity of Bethany, [and] he lifted up his hands and blessed them. While he was blessing them, he left them and was taken up into heaven. Then they worshiped him and returned to Jerusalem with great joy” (Luke 24:50–52). Acts 1:12 specifies that “the vicinity of Bethany” was indeed the Mount of Olives. Good Friday, also known as “Holy Friday,” is the Friday immediately preceding Easter Sunday. It is celebrated traditionally as the day on which Jesus was crucified. If you are interested in a study of the issue, please see our article that discusses the various views on which day Jesus was crucified…. While this post ends with Good Friday, Easter Sunday is coming. And Jesus didn’t stay in the grave. He has risen just like he said he would (see Luke 24). So I’ll end this post with these three words . . .
Three days ago I published a blog post titled, “Be Still and Know,” on my blog, “Reflections.” The subject of that blog post comes from Psalm 46:10: “Be still and know that I am God; I will be exalted among the nations, I will be exalted in the earth.” The full text of Psalm 46 is stated below the following definition. He makes wars cease to the ends of the earth. Of the Lord . . .
Is to be . . . Praised . . . .
Five days ago I published a blog post on my “Reflections” blog titled, “The Upside of Anger.” If you haven’t read it, you might wonder about the title, but you might be surprised at the content. You can take a look at it by clicking on this link. But we have this treasure in jars of clay to show that this all-surpassing power is from God and not from us. We are hard pressed on every side, but not crushed; perplexed, but not in despair; persecuted, but not abandoned; struck down, but not destroyed. I’ll be the first to admit that when I’m hard pressed for whatever reason my first response is not often love, and depending on what is or who is causing it and if it continues unabated for what seems like a never-ending period of time, love tends to fade. But be aware that it is the intent of whoever or whatever is causing us to be hard pressed to make us want to push back in anger and other destructive and/or self-destructive ways. You might want to listen to the 12-minute YouTube video I published on my “The Upside of Anger” blog post titled, “The Christian’s Guide to Anger Management,” at this link. My blog post, “The Upside of Anger,” came about because I was starting to develop a crusty edge regarding my current set of circumstances which I won’t go into because the details aren’t important. However, when one is hard-pressed day after day after day, the urge be angry at some point rears it’s head; but, again, this is exactly the type of response these types of situations try to bring out in us. And while I have not displayed any anger on the outside, I knew what I was feeling on the inside, and I was letting it build up. What I discovered while writing that blog post helped me to see that there is an upside to anger, but we humans have a tendency to use the destructive side of anger far too often. Think of “road rage” as just one example. Turn on the TV, go to a movie, or go on social media for any length of time and you’ll see plenty of examples of anger that is destructive. It’s about revenge, retribution, hate, destruction, and it’s absolutely not about forgiveness, understanding or love. That kind of anger just wants to get even in some way. A good friend who is a Greek scholar once shared with me a paraphrase of John 10:10. It gives us a clear idea of just how determined the enemy is to kill, steal, and destroy, but it also shows us that Jesus has something else altogether in mind. “The thief wants to get his hands into every good thing in your life. In fact, this pickpocket is looking for any opportunity to wiggle his way so deeply into your personal affairs that he can walk off with everything you hold precious and dear. And that’s not all–when he’s finished stealing all your goods and possessions, he’ll take his plan to rob you blind to the next level. He’ll create conditions and situations so horrible that you’ll see no way to solve the problem except to sacrifice everything that remains from his previous attacks. The goal of this thief is to totally waste and devastate your life. If nothing stops him, he’ll leave you insolvent, flat broke, and cleaned out in every area of your life. You’ll end up feeling as if you are finished and out of business! Make no mistake–the enemy’s ultimate aim is to obliterate you! When we are hard pressed, the root cause of it goes back to the words of Jesus in John 10:10: “The thief comes only to steal and kill and destroy; I have come that they may have life, and have it to the full.” And Paul makes it clear in Ephesians 6:10-18 what is the true source of all of our battles in life (see verse 12). When Jesus cleared the temple of the money changers and animal-sellers, He showed great emotion and anger (Matthew 21:12-13; Mark 11:15-18; John 2:13-22). Jesus’ emotion was described as “zeal” for God’s house (John 2:17). His anger was pure and completely justified because at its root was concern for God’s holiness and worship. Because these were at stake, Jesus took quick and decisive action. Another time Jesus showed anger was in the synagogue of Capernaum. When the Pharisees refused to answer Jesus’ questions, “He looked around at them in anger, deeply distressed at their stubborn hearts” (Mark 3:5). 1) His anger had the proper motivation. In other words, He was angry for the right reasons. Jesus’ anger did not arise from petty arguments or personal slights against Him. There was no selfishness involved. 2) His anger had the proper focus. He was not angry at God or at the “weaknesses” of others. His anger targeted sinful behavior and true injustice. 3) His anger had the proper supplement. Mark 3:5 says that His anger was attended by grief over the Pharisees’ lack of faith. Jesus’ anger stemmed from love for the Pharisees and concern for their spiritual condition. It had nothing to do with hatred or ill will. 4) His anger had the proper control. Jesus was never out of control, even in His wrath. The temple leaders did not like His cleansing of the temple (Luke 19:47), but He had done nothing sinful. He controlled His emotions; His emotions did not control Him. 5) His anger had the proper duration. He did not allow His anger to turn into bitterness; He did not hold grudges. He dealt with each situation properly, and He handled anger in good time. 6) His anger had the proper result. Jesus’ anger had the inevitable consequence of godly action. Jesus’ anger, as with all His emotions, was held in check by the Word of God; thus, Jesus’ response was always to accomplish God’s will. Those six points above and how Jesus responded are so important for us to consider when we find ourselves getting angry over any type of situation. You’re familiar with the command to the ancients, “Do not murder.” I’m telling you that anyone who is so much as angry with a brother or sister is guilty of murder. Carelessly call a brother “idiot!” and you just might find yourself hauled into court. Thoughtlessly yell “stupid!” at a sister and you are on the brink of hellfire. The simple moral fact is that words kill. Or say you’re out on the street and an old enemy accosts you. Don’t lose a minute. Make the first move; make things right with him. After all, if you leave the first move to him, knowing his track record, you’re likely to end up in court, maybe even jail. If that happens, you won’t get out without a stiff fine. Those words should give us pause to consider our own anger tendencies and learn to curtail them before they get the better of us; and when they do, make the first move and seek forgiveness whenever it is possible to do so. When you were a kid, did anyone stand up for you whenever another person was mean to you? Maybe a big brother or sister or a trustworthy friend went to bat for you. Or a parent or teacher helped protect you from harm. You may have fought some battles on your own, but at other times the problem was too big for you to handle alone. That’s when you relied on that trusted sibling or friend or adult to step in for backup. Life is filled with battles. Sometimes we’ve brought on the problem ourselves, and we need to take action to improve the situation, At other times, we’re not at all to blame. Heartbreak, pain, and difficulty seek us out, and we feel unequipped to fight on our own. No matter who or what is to blame, we can always call on Elohim Tsebaoth, the God of hosts, to join us in the battle. May the Lord . . .
Grant all . . . Your requests . . . .
About a month ago I wrote a blog post titled, “The Persistence of Memory,” which was named after one of Salvador Dali‘s most famous paintings which he completed in August 1931 when he was 27. At the time he was married to his wife, Gala, and he was “penniless and outcast from the community which had inspired much of his art.” (Quote source here.) Obviously, over time he didn’t stay that way. “Hope” is something that you want to happen, like you hope to visit Paris this summer, or the feeling that good things will come. If you make it to the final round of a tournament, that gives you hope. Most people understand hope as wishful thinking, as in “I hope something will happen.” This is not what the Bible means by hope. The biblical definition of hope is “confident expectation.” Hope is a firm assurance regarding things that are unclear and unknown (Romans 8:24-25; Hebrews 11:1, 7). Hope is a fundamental component of the life of the righteous (Proverbs 23:18). Without hope, life loses its meaning (Lamentations 3:18; Job 7:6) and in death there is no hope (Isaiah 38:18; Job 17:15). The righteous who trust or put their hope in God will be helped (Psalm 28:7), and they will not be confounded, put to shame, or disappointed (Isaiah 49:23). The righteous, who have this trustful hope in God, have a general confidence in God’s protection and help (Jeremiah 29:11) and are free from fear and anxiety (Psalm 46:2-3). The New Testament idea of hope is the recognition that in Christ is found the fulfillment of the Old Testament promises (Matthew 12:21, 1 Peter 1:3). Christian hope is rooted in faith in the divine salvation in Christ (Galatians 5:5). Hope of Christians is brought into being through the presence of the promised Holy Spirit (Romans 8:24-25). It is the future hope of the resurrection of the dead (Acts 23:6), the promises given to Israel (Acts 26:6-7), the redemption of the body and of the whole creation (Romans 8:23-25), eternal glory (Colossians 1:27), eternal life and the inheritance of the saints (Titus 3:5-7), the return of Christ (Titus 2:11-14), transformation into the likeness of Christ (1 John 3:2-3), the salvation of God (1 Timothy 4:10) or simply Christ Himself (1 Timothy 1:1). The certainty of this blessed future is guaranteed through the indwelling of the Spirit (Romans 8:23-25), Christ in us (Colossians 1:27), and the resurrection of Christ (Acts 2:26). Hope is produced by endurance through suffering (Romans 5:2-5) and is the inspiration behind endurance (1 Thessalonians 1:3; Hebrews 6:11). Those who hope in Christ will see Christ exalted in life and in death (Philippians 1:20). Trustworthy promises from God give us hope (Hebrews 6:18-19), and we may boast in this hope (Hebrews 3:6) and exhibit great boldness in our faith (2 Corinthians 3:12). By contrast, those who do not place their trust in God are said to be without hope (Ephesians 2:12, 1 Thessalonians 4:13). Faith is a complete trust or confidence in something. Faith involves intellectual assent to a set of facts and trust in those facts. For example, we have faith in Jesus Christ. This means we completely trust Jesus for our eternal destiny. We give intellectual assent to the facts of His substitutionary death and bodily resurrection, and we then trust in His death and resurrection for our salvation. Biblical hope is built on faith. Hope is the earnest anticipation that comes with believing something good. Hope is a confident expectation that naturally stems from faith. Hope is a peaceful assurance that something that hasn’t happened yet will indeed happen. Hope must involve something that is as yet unseen: “Hope that is seen is no hope at all. Who hopes for what they already have?” (Romans 8:24). Jesus’ return is our “blessed hope” (Titus 2:13)—we can’t see Him yet, but we know He’s coming, and we anticipate that event with joy. Jesus said He is coming again (John 14:3). By faith, we trust Jesus’ words, and that leads to hope that we will one day be with Him forever. Jesus was resurrected from the dead, “the firstfruits of those who have fallen asleep” (1 Corinthians 15:20). That is the basis for our faith. Then we have Jesus’ promise: “Because I live, you also will live” (John 14:19). That is the basis of our hope. The relationship between faith and hope can be illustrated in the joy a child feels when his father tells him they are going to an amusement park tomorrow. The child believes that he will go to the amusement park, based on his father’s word—that is faith. At the same time, that belief within the child kindles an irrepressible joy—that is hope. The child’s natural trust in his father’s promise is the faith; the child’s squeals of delight and jumping in place are the expressions of the hope. The following is a report on the practical applications of Dr. Kenneth Hutcherson‘s (1952-2013) book, “Hope is Contagious: Trusting God in the Face of Any Obstacle,” (published by Zondervan). Stop simply surviving and start thriving. Don’t let difficult circumstances stop you from making the most of each day you’re alive. Realize that even when times are tough, you can do much more than just endure your current situation. You can actually enjoy life to the fullest–even in the middle of the worst circumstances–when you remember that life if a gift from God and decide to embrace it. Ask God to help you notice His presence with you in every situation, and rejoice when you sense Him nearby. Pray for the Holy Spirit to renew your mind each day so you can have the positive attitudes you need to thrive no matter what is going on in your life. Choose to trust. When something bad happens in your life, don’t respond by arguing with God or rebelling against Him. Instead, trust God to keep His promise to use all circumstances–including the bad ones–to accomplish good purposes in your life. Remember that God is perfect, so He can’t make any mistakes, and whatever He chooses to do is for a good purpose. If He has allowed something difficult to happen to you, there’s a reason. Learn and grow from your struggles. God allows you to experience challenging circumstances so you can learn to love and trust Him in deeper ways, and so you can grow more mature, developing a strong character to become more like Jesus. Keep in mind that God is more interested in your lasting holiness than your temporary happiness, because holiness will help you learn to choose what’s best for you. Ask God to help you see your struggles from His perspective. Let your struggles teach you whatever God wants you to learn from them. As you deal with the difficulties in your life, stay focused on what matters most–eternal values–so you can grow into a stronger person in the process. Resist temptations to sin. Don’t turn to sinful behaviors to try to escape the pain of the tough circumstances you experience; doing so will only make your pain worse. Instead, pray for the strength you need to resist temptation, and pour out your feelings to God. God will respond by giving you comfort that you can’t find from any other source. Attract others to faith as they watch you. Other people are watching you as you deal with difficult situations. If you respond by being faithful to Jesus, they’ll be drawn to Him themselves because you’ll show them what real faith in action looks like, and that’s attractive. So rather than complaining about your struggles or compromising your values as you try to deal with them, invite Jesus to shine His light through your life, and reflect His character qualities so other people can see how a relationship with Him can help them when they face their own struggles. Want what God wants for you. Don’t make the mistake of thinking that God doesn’t care about you if He doesn’t give you whatever you ask Him for. Realize that God loves you so much that He gives you what you need, even when it’s not what you want. Keep in mind that, because of your limited perspective on life compared to God’s unlimited perspective, sometimes you ask God for something that seems good but can actually harm you. Trust in the fact that God knows what you need to have the life that brings you the greatest good. Ask God to bring your desires in line with His will for you. Overcome fear. No matter what kind of situation you may find yourself facing, don’t be afraid, because God will always be with you and have your best interests in mind since He loves you. Whenever feelings of fear creep into your life, turn to God for the help you need to overcome them and successfully navigate your circumstances. Whenever you sense God calling you to do something that requires taking a risk, move forward without fear because God will empower you to do whatever He calls you to do. Keep heaven in mind. Remember all that awaits you in heaven at the end of your life here on Earth. Let the anticipation of the wonderful experiences you’ll have in heaven motivate you to meet your current challenges with the hope, which will lead to the strength you’ll need to get through any situation. As you think about heaven, focus your mind on what truly matters and let distractions go so you can live life to the fullest right now. Don’t give up. Whenever your sense of hope starts running out, ask God to renew you with a fresh dose of hope so you can continue to faithfully deal with the difficult situations that come your way. Be confident that at the right time, God will reward you for your faithfulness if you don’t give up your faith in the middle of challenging circumstances. Count on God to give you more hope whenever you ask Him for it. I’ll end this post with the words from Isaiah 40:28-31: Do you not know? Have you not heard? The Lord is the everlasting God, the Creator of the ends of the earth. He will not grow tired or weary, and his understanding no one can fathom. He gives strength to the weary and increases the power of the weak. Even youths grow tired and weary, and young men stumble and fall; but those who hope in the Lord will renew their strength . . . They will soar on wings like eagles . . . They will run and not grow weary . . . They will walk and not be faint . . . . Being paid the ‘humble’ compliment can be worse than when a woman gives her romantic partner the “you’re a nice guy” letdown. 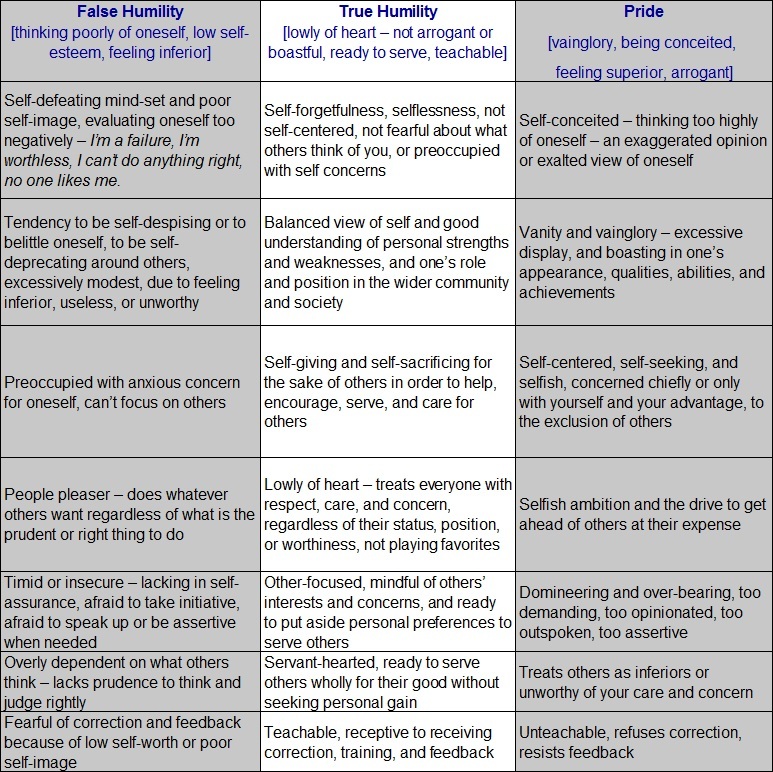 But many positive psychologists feel that humility is due for an image makeover. Humility also has another public relations challenge: It’s not exciting. We might appreciate the trait in others—we don’t feel threatened by unassuming people—but in ourselves? Eh. We’d rather be confident and bold. We’ll take that spotlight, thank you very much. Humility doesn’t have the Oprah-worthy, leather-bound gratitude journals, nor does it feature optimism’s sunny, iconic smiley face, nor the heartwarming imagery of compassion. So what is humility? Paul summed it up in Philippians 2:3-4: “Do nothing out of selfish ambition or vain conceit. Rather, in humility value others above yourselves, not looking to your own interests but each of you to the interests of the others.” It shows up in our actions and our attitudes towards others. It is, as Paul states, valuing others above ourselves. And that’s not easy to do in our materialistic, money-driven, and “Me” oriented society. A humble person is teachable. Humility believes it can always learn from the education and experiences of others. A humble person is a growing person who is quick to read, invite feedback, and ask good question. A humble person is at peace with themselves and others. Humility embraces contentment and simplicity. It doesn’t need to have the nicest or be the best. Humility puts relationships before the need to be right. Humility enjoys balance and harmony. A humble person is grateful. Humility isn’t entitled. Humility believes it doesn’t deserve a darn thing and is thankful for the many blessings received in life. A humble person is slow to offend and quick to forgive. Humility is keenly mindful of the grace it has received and is quick to extend that grace to others. A humble person asks for help. Humility helps us know who we are and who we are not. Humility allows us to live authentically. Humility sees assistance and support as an opportunity to develop and not as a sign of weakness. A humble person treats everybody with respect. Humility teaches us to believe that we are not much better or worse than anybody else, all people have great value, and all people deserve to be treated as such. A humble person is patient and doesn’t easily get frustrated with the imperfection of others. Humility knows that mistakes and inadequacies are part of life. Humility is tolerant of self and others when deficiencies appear and failures happen. A humble person recognizes their own limitations. Humility doesn’t have a negative view of self. Humility has an accurate view of self. Humility leads us to the powerful and beautiful place of living out our strengths and passions in life. A humble person celebrates the accomplishments of others. Humility sees others as co-pilgrims and collaborators and not competitors. Humility genuinely rejoices when others prosper and triumph. I was parked in front of the mall wiping off my car. I had just come from the car wash and was waiting for my husband to get out of work. Coming my way from across the parking lot was what society would consider a bum. From the looks of him, he had no car, no home, no clean clothes, and no money. “I hope he doesn’t ask me for any money,” I thought. He didn’t. He came and sat on the curb in front of the bus stop but he didn’t look like he could have enough money to even ride the bus. After a few minutes he spoke. “That’s a very pretty car,” he said. I said, “thanks,” and continued wiping off my car. He sat there quietly as I worked. The expected plea for money never came. As the silence between us widened something inside said, “ask him if he needs any help.” I was sure that he would say “yes” but I held true to the inner voice. “Do you need any help?” I asked. He answered in three simple but profound words that I shall never forget. I expected nothing but an outstretched grimy hand. He spoke the three words that shook me. “Don’t we all?” he said. I was feeling high and mighty, successful and important, above a bum in the street, until those three words hit me like a twelve gauge shotgun. I needed help. Maybe not for bus fare or a place to sleep, but I needed help. I reached in my wallet and gave him not only enough for bus fare, but enough to get a warm meal and shelter for the day. We often look for wisdom in great men and women. We expect it from those of higher learning and accomplishments. No matter how much you have, no matter how much you have accomplished, you need help, too. No matter how little you have, no matter how loaded down you are with problems, even without money or a place to sleep, you can give help. Even if it’s just a compliment, you can give that. Maybe that man was just a homeless stranger wandering the streets. You know the type. In meetings with the boss, your co-worker is deferential and winsome, but back in the office he’s full of bluster and condescension for all around him. In public, he wears humility like it’s a comfortable hat; in private, he’s all about his own self-interest. Whether in business or politics, on the athletic field or in the classroom, there are lots of people who feign humility but in fact care only about their own agendas. 1. Real humility leads a person to be curious about and concerned for others, not fixated on how others can lead to one’s own enrichment. Humility is putting others first in thought, word, and deed. It resists the temptation to self-aggrandize. It’s easy to feign interest in another person if there’s something in it for you, like a job promotion or increased recognition. A person with humility is in it for the long-term common good, not short-term self-interest. Examples include helping colleagues because of who they are, not because of their position, or writing a great letter of reference for a young person. As a young man, George Washington had an enormous ego and insatiable appetite for renown. Once he recognized that he had to be ambitious for goals beyond his own advancement, he was better able to check his ego and resist the allure of power for its own sake. Humility is often erroneously portrayed as poor self-esteem, but in fact it’s the arrogant who have a distorted sense of self. Arrogant people have an exaggerated view of their own contributions, and limit the good they might do by clamoring for credit. 3. In admitting an error or acknowledging that one is wrong, the humble person not only apologizes but also changes course. A person pretending to be humble might say a halfhearted “sorry,” but stubbornly continues down the same path. Throughout his career, Abraham Lincoln was willing to learn from his mistakes. Like George Washington, Lincoln was a man of immense ambition, but as he made humility his habit, he was able to see with greater moral clarity. Whether in political or military decisions, Lincoln was willing to own up to his errors. “I now wish to make personal acknowledgment that you were right, and I was wrong,” Lincoln wrote Union Army General Ulysses S. Grant on July 4, 1863. Referring to the General’s decision-making, and ultimate success at the critical Battle of Vicksburg, Lincoln admitted that his own strategic advice had been incorrect. He thanked General Grant for “the almost inestimable service” he gave the nation in making the right decision. 5. The more responsibility or power one has, the more humility they need. Often those who have displayed false humility in an upward climb reveal their arrogance when they’ve reached the top. We can be confident that George Washington’s humility was real because when he was at the peak of power he relinquished it—twice—first as general in returning to civilian life and then again as president in leaving office after two terms. This chart was created by Don Schwager. “It’s hard to be humble,” says an old country song, “when you’re perfect in every way.” Of course, few people actually think they’re perfect in every way. But it can still be pretty hard to be humble, especially if you live in a society that encourages competition and individuality. Yet even in such a culture, humility remains an important virtue. Learning to be humble is of paramount importance in most spiritual traditions, and humility can help you develop more fully and enjoy richer relationships with others, as well as create opportunities and earn you respect. Admit you are not the best at everything–or anything. Don’t take all the credit. Appreciate the talents and qualities of others. Don’t be afraid to defer to others’ judgments. Seek guidance from written texts. Rejuvenate your sense of wonder. Don’t confuse being humble with being sycophantic (being overly-praiseful of someone for your own profit). This is a common misconception, but the two attitudes are completely different. To be humble isn’t the same as being humble, and often people who pretend to be humble do it in order to seek out praise. Other people will recognize this, and even if you fool some, you won’t derive the same benefits as you would through actually developing humility. Forgiving one another . . .
As God in Christ . . .
Forgave you . . . . The opening verse took me back to ten years ago in April when I lost my job in Houston, and after a massive years-long job search I never found another one. And almost five years ago, I lost my last apartment when the house where it was located was sold and the new owners wanted to use my apartment for their own purposes. Since then, I’ve been living in hotel rooms as my only source for housing due to my low income on Social Security (I started received it in mid-2014 when I turned 62) while conducing my low income senior housing search. I never dreamed after losing my last apartment in March 2014 that a housing search would take years and end up like my years-long job search which produced zilch. It’s almost as if a brick wall has been built in front of me as I haven’t been able to move forward in any direction (jobs, housing) no matter how hard I try. These past ten years have been some of the toughest ten years of my entire life. It’s very hard to forget the circumstances around what happened to me back then that caused me to lose a job that I only had for seven months, but has lead–for reasons still unknown to me to this day–to long term unemployment as I never found another job in my field again. I moved a thousand miles for that job, never dreaming it was going to end a scant seven months later, and I lost a whole lot more then that job when I lost that job, too. It’s been hard to not be able to get any type of closure on what happened back then and why it has essentially left me unemployed for the past decade–a full ten years before normal retirement age. The financial loss alone over these past ten years has been staggering, but even more than that, it affected my lifestyle and it touched every area of my life. The major corporation that owned the institute (a college) where I was employed ten years ago (they owned over 100 for-profit colleges and universities nationwide) filed for Chapter 7 bankruptcy on July 2, 2018 (source here), after several years involving some major lawsuits (click here for just one example from a 2015 lawsuit resulting in a $95.5 million dollar settlement), huge financial losses, and several rounds of layoffs over a five-year period of time starting in 2012 (click here for an example of layoffs in 2016). Due to the circumstances surrounding that job loss, three months after I was fired I found some physical evidence on my laptop of what had been going on behind my back while I worked there, and I sent that evidence along with a four-page letter to my lawyer who I saw a few days after I was fired in order to have her review the separation agreement I had received. The evidence I found and sent to her six months later was rock solid, yet I never heard back from her. I did receive a certified notice from the Post Office that my letter had been received in her office. From my one meeting with her for an hour regarding my separation agreement six months earlier, she didn’t strike me as the kind of person who would not at least acknowledge receipt of my letter especially in light of the information I provided in that letter. If I had found another job shortly after losing that job I would have considered that experience to be a “bump in the road” and I would have moved on. I’d still have my career and still be earning a salary, and I would have continued to contribute into my Social Security account and a small retirement account I started in my 40’s. Unfortunately, I didn’t find another job, and the lack of a steady paycheck from the day I was fired was crushing. I stopped counting the number of jobs I applied for when it reach 500 two years later (but I didn’t stop applying for jobs). I was single and self-supporting, and nobody was going to pay my bills but me, but I couldn’t find a job. So it’s been hard to forget the past, especially looking out of a hotel room window now for over four and a half years that I never dreamed I would be looking out of ten years after I lost that job. Sometimes the things God wants us to forget are really huge and still ongoing and impacting our lives. However, during this time my faith has grown exponentially in ways I never expected. God has seen me through some incredibly tough stuff I never thought I would encounter and in some cases, survive, on more than one occasion. He has made me strong in areas that were my weakest, but it’s been a long and sometimes arduous journey over time, and it certainly didn’t happen overnight. And it’s still ongoing. My story doesn’t look like a typical Christian “success” story of the kind we so often like to hear in America–re: the “rags to riches” stories that happened because we (1) faithfully tithed or (2) “fill in the blank” with the happy kind of stuff we hear in those rags to riches stories. Living in a hotel room for over four and half years on a Social Security income and receiving financial help from my 95-year-old father to pay for it doesn’t look or sound very “successful” to probably most Christians or anyone else living in America today. We tend to have a somewhat warped view of what “success” is supposed to look like as Christians in America. It resembles our culture’s view of success and not God’s view of success. During these past ten years, God has been showing me many things I was too busy to notice during all those years I worked. I have learned the incredible value of fasting, and I don’t say that to sound “spiritual.” I’m not the type to put on pretenses or play “religious” games. And I’ve learned just how incredibly important even a few words from the Bible can be at just the right time to guide and direct. And when I haven’t known what to pray, the Psalms became my prayer book. I look back over all the stuff I’ve gone through; all the places I’ve traveled by car; and how the little money I had to live on was stretched in ways that sometimes seemed impossible to believe; God has come through for me each and every time in the most amazing ways that only I would recognize. During this time I went through three years and two months between when my last unemployment check arrived ($275/wk) in May 2011 and my first Social Security check began ($1000/mo) in July 2014 with no income at all, and God guided me through it. In fact, there are no words to describe all I have learned about trusting God over these past ten years. I’ve also learned much about what is going on in our society that I didn’t really notice when I was working. Outside of Christian circles I’ve been sometimes shocked at how belief in God (as in the God of the Bible) is often seen as a joke by some (not a small number) especially in the younger generations. Since I never married and I didn’t have children, I wasn’t aware of how fast things were changing in our culture especially in the generations starting with the children of Baby Boomers (my generation). Also, when I was working my friends were mostly Christians, and the Christian community can very insulating when it comes to noticing what is really going on in our society outside of Christian circles (or in some cases inside of them, too). Also, over these ten years I’ve acquired many new interests and renewed some older interests, like writing. In fact, I started this blog as a way to record my experience with long term unemployment back in 2010, and it has broaden considerably from that subject over these years. I now have almost 600 blog posts on this blog, and I started a second blog in April 2018 that has almost 50 blog posts on it to date. I cannot begin to put a dollar value on what I’ve learned and experienced and seen God do first hand in providing for me and guiding me through these past ten years. While I’ve had some considerable material and financial losses from losing that job ten years ago and never finding another job, I have gained a whole new world that has opened up to me through my writings, and my travels, and my experiences that the “brick wall” that I’ve constantly run up against in my job search and housing search can’t stop. And no job or any amount of money can replace all that I have learned. Also, I’ve learned to let go of the anger I had for so long after losing that job when–no matter how many jobs I applied for or how many interviews I sailed through at the beginning of my job search–I never found another job. I was sure back then God was going to lead me to the right job as He knew I was single and self-supporting, but He had something different in mind as stated in Isaiah 55:8-9. And, I’ve learned a lot about what is going on in America today that I didn’t know was going on, and much of it has come from when I started traveling by car to different cities starting in 2012 to look for work, and also when this “hotel saga” got it’s start in late September 2014. I had no idea how many people are forced to live in hotels as their only housing option (which has been my only housing option, too, since it started in 2014). It is an entirely different world living in hotels with all kinds of people coming and going. It is also living in very close quarters in a very small space with complete strangers living only a few feet away in any direction from your own room. It’s been a real learning experience, and I don’t see people my age living in hotels, so it’s not a social outlet. By it’s very nature it is a transient way to live. So, I guess you could say that the “new thing” God has been doing in my life over this past decade has been to broaden my world and to get me to really see what is going on out there in it. I had no clue about most of it when I was still working. Now we come to the part that I’m still waiting to find out about. I’m not sure what it will look like when it finally arrives as I’ve learned over these past ten years that God is always full of surprises. Ten years ago I thought it would be a new job. Five years ago I thought it would be a new apartment to live in after losing my old apartment to the new owners. And neither of those things happened. While I am still waiting to find a more permanent and affordable place to live that isn’t just another hotel room, who knows but that God might have something totally different in mind that I haven’t even thought about, or maybe that I have only thought about in passing. He can break down a brick wall with no effort at all, but it has to be in His timing. Over this past decade I have learned to take each day as it comes. It’s all any of us get anyway. God knows us thoroughly, inside and out, and far better then we know ourselves. He knows how I’ve grown a bit weary of living in a hotel room, but then He reminds me that there are probably a bunch of other folks living here who wish they could move on, too. So I am grateful to have a roof over my head, even if it is still a hotel room, and I will continue to wait and see what that “new thing” is that He will bring into my life. In the wilderness . . .
And rivers . . . In the desert . . . . I read a Tweet on Twitter the other day that mentioned a new book coming out on March 5, 2019, titled, “The Unsaved Christian: Reaching Cultural Christianity with the Gospel,” by Dean Inserra, founding and lead pastor of CITYCHURCH in Tallahassee, Florida. Information on the book including the Table of Contents and the first few pages of the book (Preface, and a few pages of Chapter 1 titled, “Help Them Get Lost: The Case for Reaching Cultural Christians”) is available on Amazon at this link (click on the book icon on the Amazon page to examine parts of the book). As of the publishing of this blog post the book isn’t out yet (but it will be in a few days on March 5, 2019), so I’ve listed the information above for anyone who might be interested in this topic or in reading the book. Cultural Christians are deists, pantheists, agnostics, atheists, and antitheists who adhere to Christian values and appreciate Christian culture. This kind of identification may be due to various factors, such as family background, personal experiences, and the social and cultural environment in which they grew up. Contrasting terms are “biblical Christian”, “committed Christian”, or “believing Christian”. Today… the greatest threat to Christianity is found not in the arguments of the atheist but in the assumptions of the apathetic. The danger is not a hostile reception of belief in God but an incurious indifference to the idea. We have all met the apathetic. Their response to the question of God’s existence is a shrug, a sigh, or a grin. There are two main kinds of apatheists: apathetic agnostics and apathetic atheists. Apathetic agnostics believe it is not worth debating whether or not God exists; perhaps because human beings cannot know the answer and perhaps because if God exists, He does not care whether one believes in Him. What’s true is what you make true, as represented metaphorically by “ideas” like the devil or God, according to them…. Cultural Christianity is religion that superficially identifies itself as “Christianity” but does not truly adhere to the faith. A “cultural Christian” is a nominal believer—he wears the label “Christian,” but the label has more to do with his family background and upbringing than any personal conviction that Jesus is Lord. Cultural Christianity is more social than spiritual. A cultural Christian identifies with certain aspects of Christianity, such as the good works of Jesus, but rejects the spiritual aspects required to be a biblically defined Christian. Some people consider themselves “Christians” because of family background, personal experience, country of residence, or social environment. Others identify as “Christian” as a way of declaring a religious affiliation, as opposed to being “Muslim” or “Buddhist.” Famed scientist and atheist Richard Dawkins refers to himself as a “cultural Christian” because he admires some of the ceremonial and philanthropic aspects of Christianity. Dawkins is not born again; he simply sees “Christianity” as a label to use. In free nations, the gospel is often presented as a costless addition to one’s life: just add churchgoing to your hobbies, add charitable giving to your list of good deeds, or add the cross to the trophies on your mantle. In this way, many people go through the motions of “accepting Jesus” with no accompanying surrender to His lordship. These people, who do not “abide in Christ,” are cultural Christians. They are branches that hang around the True Vine but have no true attachment (see John 15:1–8). There was no such thing as cultural Christianity in the days of the early church. In fact, to be a Christian was to more than likely be marked as a target of persecution. The very term “Christian” was coined in the city of Antioch as a way to identify the first followers of Christ (Acts 11:26). The first disciples were so much like Jesus that they were called “little Christs” by their detractors. Unfortunately, the term has lost meaning over the years and come to represent an ideology or a social class rather than a lifestyle of obedience to God. Cultural Christianity is not true Christianity. A true Christian is one who has received Jesus Christ as personal Lord and Savior (John 1:12). Christ’s death and resurrection has been appropriated to that person as his or her substitute for sin (Romans 10:8–10; 2 Corinthians 5:21). The Holy Spirit indwells that person (Romans 8:9). “Receiving” Christ is far more than a mental acknowledgment of truth. Satan acknowledges the identity of the Son of God (Mark 5:7). The faith that saves us also changes us (see James 2:26). Jesus said that anyone who wishes to become His disciple must “deny himself, take up his cross daily, and follow me” (Luke 9:23). While we cannot earn salvation by sacrifice or good works, a lifestyle transformation and desire to please the Lord are direct results of being “born again” (John 3:3). • Denying the inspiration of Scripture or parts of Scripture (2 Timothy 3:16; 2 Peter 1:21). • Ignoring or downplaying true repentance as the first step toward knowing God (Matthew 4:17; Acts 2:38). • Focusing on Jesus’ love and acceptance to the exclusion of His teaching on hell, obedience, and self-sacrifice (Matthew 4:17; 23:33; Mark 9:43; Luke 12:5). • Tolerating or even celebrating ongoing sin while claiming to know God (Romans 1:32; 1 Corinthians 5:1–2; 1 John 3:9–10). • Redefining scriptural truths to accommodate culture (Numbers 23:19; Malachi 3:6). • Understanding Jesus to be primarily a social reformer, rather than God in the flesh who is the sacrifice for our sin (Matthew 10:34; Mark 14:7). • Claiming God’s promises while ignoring the requirements included with them (Psalm 50:16; Jeremiah 18:10). • Denying or minimizing Jesus’ claim that He is the only way to God (John 3:15–18; 14:6). • Performing enough religious activity to gain a sense of well-being without a true devotion to Jesus (Galatians 5:16–17; Romans 8:9). • Talking much about “God” in a general sense, but very little about Jesus Christ as Lord (John 13:13; 14:6). • Seeing protection and blessing as goals to be achieved, rather than byproducts of a love relationship with God (Mark 12:30; Deuteronomy 11:13–17). • Choosing a church based upon any or all of the above (Revelation 3:15–17). One of the greatest obstacles to becoming a committed Christian is that Christianity is challenging. The task of living a fully God-centered life is no walk in the park, as the lives of the greatest and most fully converted Christians who have ever lived—the saints—will attest. Indeed, Christianity lived to the fullest involves struggle. But is the struggle worth it? Often the skeptic will see the struggle and be deterred. What he may not see—perhaps a result of self-inflicted spiritual blindness—is the outflow of joy that permeates every saint’s struggle; and if he does see it he will not want it—not because he does not want joy but rather because he does not want joy enough to give up his old ways. But, of course, even the most hardened skeptic cannot be considered a total write-off. Indeed some skeptics are eventually compelled to change their mind. This is the hopeful realization that drives evangelization. For most of US history, to be American was to be “Christian.” National identity was conflated with religious identity in a way that produced a distorted form of Christianity, mostly about family values, Golden Rule moralism, and good citizenship. The God of this “Christianity” was first and foremost a nice guy who rewarded moral living by sanctifying the American dream: life, liberty, and the pursuit of happiness (i.e., a substantial 401(k), a three-car garage, and as many Instagram followers as possible). This form of Christianity—prominent in twenty-first-century America—has been aptly labeled “Moralistic Therapeutic Deism,” a faith defined by a distant, “cosmic ATM” God who only cares that we are nice to one another and feel good about ourselves. This faux God—stripped of theological and historical specificity and closer to Santa Claus than Yahweh—began to flourish amidst the gradual “death of God” narrative advanced by philosophical, literary, artistic, and scientific elites from the Enlightenment to postmodernity. In this context, mainstream Christianity became less about truly believing in God and supernatural events like the incarnation and resurrection; it became more about the rites and rituals of Christianity-flavored morality: a convenient, comfortable, quaint system of personal and societal uplift. Thankfully, and predictably, this sort of toothless, “nice,” good-citizen Christianity is on the decline. The form of life Jesus offers his followers is not one of social integration but a scandal to the priestly and political establishment. It is a question of being homeless, propertyless, peripatetic, celibate, socially marginal, disdainful of kinsfolk, averse to material possessions, a friend of outcasts and pariahs, a thorn in the side of the Establishment and a scourge of the rich and powerful. Rather than being a cause for alarm, the dying-away of cultural Christianity should be seen as an opportunity. It used to be too easy to be a Christian in America; so easy that one could adopt the label simply by being born in this “Christian nation” and going to church once or twice a year (if that), in between relentless attempts to swindle the stock market, accumulate beach properties, and build an empire of wealth and acclaim. The Book of Acts, like the Gospels before it, shows us that Christianity thrives when it is, as Kierkegaard put it, a sign of contradiction. Only a strange gospel can differentiate itself from the worlds we construct. But the strange, freakish, foolish old gospel is what God uses to save people and to resurrect churches (1 Cor. 1:20–22). Following Christ is not one’s golden ticket to a white-picket-fence American dream. It’s an invitation to die, to pick up a cross. Christians are those who give themselves away in love and sacrifice to advance a kingdom that is not of this world (John 18:36). I’ll end this post with the words of Jesus found in Matthew 11:28-30: Come to me, all you who are weary and burdened, and I will give you rest. Take my yoke upon you and learn from me, for I am gentle and humble in heart, and you will find rest for your souls . . .
For my yoke is easy . . .
And my burden . . .
Is light . . . . However we interpret this small 9 ½ X 13 inch (24.1 x 33cm) work, its influence on the wider art world cannot be in doubt. First shown in Paris at Galerie Pierre Colle in 1931, the painting was also exhibited at the first Surrealist exhibition in the United States, at the Wadsworth Athenaeum, Hartford, Connecticut, in 1931, then, in 1934, by Julien Levy in New York. Dalí and his wife Gala accompanied the painting over to New York in 1934, travelling third class with the financial assistance of Pablo Picasso. By this point Dalí had been formally expelled from the Surrealists, partly due to his political opinions, but also thanks to his enthusiasm for American popular culture, something… his fellow European Surrealists disdained. For all of the analysis taking place over the years regarding Dali’s most famous painting, I find it amusing that the artist, himself, admitted that he did not know what it meant. Yet, the persistence of memory in our own lives can and does have both negative and positive effects on our lives. Ask people where they were when the Twin Towers fell on September 11, 2001, and it’s a good bet that they’ll remember without hesitating. They may even recall specific details about the day, such as exactly what they were doing just before they saw the news reports of the terror attacks. This remarkable ability to conjure up even the smallest details surrounding a tragic or traumatic event is directly related to the intensity of the event itself. In other words, the more emotionally disturbing the experience is to us, the more likely we are to commit it to memory [source: Science Daily]. This is because memory and emotion are inextricably linked in the human brain. But while people seem to easily remember tragic events and the seemingly insignificant details associated with them, many would be hard-pressed to recall the minutia of their happy times. For example, mothers often have trouble summoning the specifics of their children’s birth, but are amazingly accurate in recounting the duration and intensity of the labor process. It begs the question, “Do we remember the bad times better than the good?”…. In modern society, very bad memories can be psychologically debilitating. For example, war veterans sometimes experience flashbacks of being in combat zones when they return to civilian life, which can be extremely distressing. The good news is that people can also benefit from reliving positive experiences, such as remembering the overall sense of well-being that comes from being deeply happy. This is because good memories can cause the release of dopamine, a neurotransmitter associated with feelings of pleasure [source: Lang]. Clausen suggests that happy memories can also positively affect our mental health and can be used therapeutically to reduce the symptoms associated with bad memories…. Let’s be real: I know no one likes to dwell on the bad, painful parts of our lives. But can bad memories actually be good? Generally speaking, the hard parts are the aspects of our lives we try to bury deep and “move on” from; however, a lot of research shows that there’s much to be gained from digging deep and understanding our bad memories. Here’s how you can get something positive about some of your more painful recollections, according to science. Basically, our brains (and bodies) process information in a way that hinges on our survival: if we have a negative experience, or an experience that, for example, brings us a great amount of fear, our body begins to teach itself to be wary of the same event happening again. While this is useful if you’re, say, hunting in the wilderness and need to be super in-tune with nature, “Hunger Games”–style, it is not so useful if a memory you’re repressing is preventing you from experiencing an otherwise enjoyable part of your everyday life. But still—if you could just get rid of the bad memory, you would, right? That is, of course, way easier said than done. While it may feel easier to just repress hard things or try to push them out of our minds, reflecting back on, processing, and learning from bad memories is how we develop and grow as people. It’s important, too, to draw a clear line between reflecting back on painful memories in an attempt to process and learn from them, and experiencing reoccurring memories which negatively impact your life…. (1) You Gain Understanding: Sometimes our bad memories stem from places that we don’t fully understand. Either we don’t entirely remember what happened, or we understand the logistics, but not the why behind it. Having unanswered questions, or have information that feels unsatisfactory, can feel incredibly frustrating, especially when something negatively impacted your life or the life of someone you care about. When bad memories take control over our minds and hearts, it can make you feel helpless and vulnerable. That’s why it’s important to get to the root of your hard memories and therein, the root of the issue. Sometimes, though it can be really tough, the only way out is through. (2) You Learn Some Important Lessons: That’s right: Confronting hard memories may help you learn some pretty important life lessons. I know it sounds cliche, but we’re all basically shaped by our past experiences, including the negative ones. Whether your bad memories are rooted in decisions you actively made, or things that happened to you over which you may not have had much control, it’s important to work through them and process them fully. This allows you to have a distance from the situation and learn from it; either in terms of how you’ll handle a situation differently in the future, or by seeing the strength you have through surviving a traumatic event you were a victim of. No matter the scenario, there is always room to recognize growth and learn from an experience. (3) You Can Confront People From Your Past: Sometimes we come to the realization that we simply can’t make sense of our bad memories on our own—that there’s some missing information we simply aren’t privy to—and in order to feel a piece of mind, we reach out to others. Now, it’s important to remember that just because you want to talk about something doesn’t mean other people are ready (or will ever be ready) to, so there’s a point in which you need to work on finding closure in any way you can, even if it isn’t the ideal circumstance. However, if you can get in touch with someone and they’re OK talking to you about what’s been on your mind, it can be really beneficial to hear someone else’s perspective and their version of what happened. This may reinforce what you thought and help you feel valid in your feelings, or may lighten the burden of what you perceived was on your shoulders. To overcome bad memories you must: (1) Reframe them. Looking back, Joseph said, “You meant evil against me, but God meant it for good” (Genesis 50:20 NAS). (2) Reject them. The next time a bad memory resurfaces, refuse to entertain it. “Do not…ponder the things of the past.” (3) Refocus your thoughts. “Forgetting those things which are behind and reaching forward to those things which are ahead” (Philippians 3:13 NKJV). You say, “I can’t help remembering.” If you can recall your troubles, you can recall your blessings. The most effective way to overcome bad memories–is to replace them with good ones! And here’s some good news: Every promise God gives you contains the power to fulfill it. So meditate on these words and personalize them: “Fear not…do not feel humiliated, for you will not be disgraced; but you will forget the shame of your youth” (Isaiah 54:4 NAS). “The former things shall not be remembered or come into mind… be glad and rejoice forever in that which I create” (Isaiah 65:17-18 AMP). Notice the word “create.” God can create beauty out of ashes and order out of chaos–but it doesn’t happen overnight. You’ll do a lot of growing and forgiving along the way. In some cases you’ll forgive others; in other cases you’ll forgive yourself. You say, “But all those promises are from the Old Testament!” Yes, but the Bible says, “He carries out and fulfills all of [His] promises, no matter how many… there are” (2 Corinthians 1:20 TLB). So bring your bad memories to God and let Him heal them. All of us have some bad memories caused by ourselves or by others or a combination of the two as in the case of divorce, but it is what we do with the bad memories that is most important. As the devotion above states at the end–“Bring your bad memories to God and let Him heal them.” After all, God stated in Isaiah 43:18-19: Forget the former things; do not dwell on the past. See, I am doing a new thing! Now it springs up; do you not perceive it? I am making a way in the wilderness . . .
And streams . . . In the wasteland . . . .